The personnel responsible for the formwork’s assembling must be notified of the excavation drawing because every possible mistake during the excavations will have an effect upon the formworks’ implementation. The building’s foundation is faintly presented in the excavation drawing so as to confirm the general dimensions of the excavation. Moreover, this helps the growth of the building’s entire concept in all the materialization bodies involved in the work. 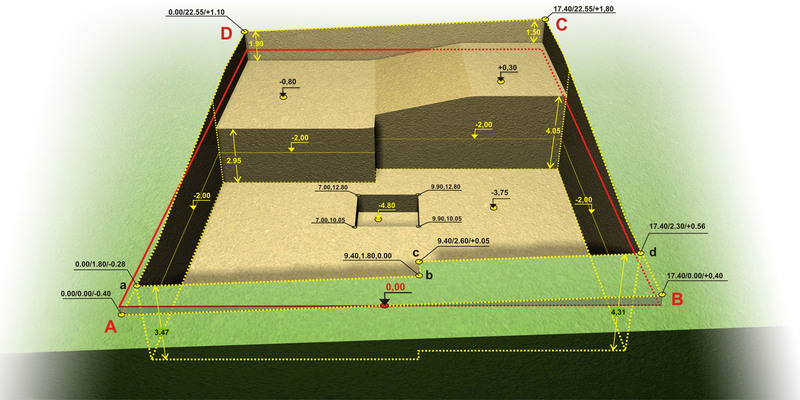 The coordinates x, y, z [*] NoteDuring the excavation, the final floor must be defined based upon an accurate measurement in two phases: 1st) when the excavation has advanced enough, we take a measurement e.g. at -2.0 and we mark a clearly defined line around the perimeter of the pit (see the 3D figure of the excavation), 2nd) when the excavation is almost finished, we must confirm its final depth and the floor’s horizontality. of the chosen system are marked upon every corner of the excava-tion’s peripheral polygon. In this specific example, the origin of the coordinate system (x,y) has been defined as the lower left edge of the building land and the origin of the z axis as the middle of the forefront’s side walk which coincides with the 0.0 [*] NoteIt is recommended to set the origin of the height measurements (0,00) as the upper level of the ground floor’s floor slab, because if we change the relative position of the building, the topographic drawing will be the only one to modify. Moreover, the technicians will easily measure the floor heights from the same level without the danger of errors. as set in the urban planning drawing. The final excavation level is defined by a value upon the z axis. In the case of a bench, only the two coordinates x and y are written upon the polygon points e.g. in the deepened excavation around at the elevator’s area. The sections present the excavation in a simple way. The thickness [*] NoteThe thickness of the leveling concrete layer is an average value, this means that no matter how meticulous the excavation is, if the mean value of the concrete thickness is 100 m, the actual thickness in the various parts will range e.g. between 50 and 150 mm. of the leveling concrete [*] NoteThe leveling concrete is indented to level the excavation floor’s anomalies and not the anomalies of the ground’s texture, e.g. a surface that has been grooved (and disrupted) by the bucket teeth of an excavator. The leveling concrete must be casted after we firstly eliminate these marks by a mechanical or manual way. is also displayed while it is very helpful to show with a faint line and the structural frame of the building that is going to be erected. The excavation [*] NoteAs a rule, the altitudes z of the natural ground are approximate values therefore the volume of the superjacent soil is also an approximate estimation. The word Estimation of quantities includes every calculable or incalculable approximation considered in almost every work. volumes, the filling quantities and the amount [*] NoteThe leveling concrete must extend along the entire excavation area and not only in the erection area as it serves other reasons as well like the avoidance of a muddy surface due to rain or a faucet left open. of the leveling concrete are writ-ten upon the drawing. The excavation volume is separated into two quantities, the first regards the excavation below the lowest point of the ground and the other regards the excavation above the lowest point of the ground. The estimation of the first quantity is more reliable than the estimation of the second quantity. The filling is also separated into two quantities, the first regards the quantity required for the foundation filling (upon which the basement floor will be constructed) and the second will be re-quired for the backfill of the excavation part that extends beyond the structural frame, after the construction of the basement shear walls. In this phase of the construction, the filling quantities must be mentioned in order to be possibly combined with the collection/storage of the excavation spoil. The amount of the leveling concrete depends upon the average necessary thickness required for the formation of a horizontal floor upon which the foundation will be sited. A higher depth accuracy and a more horizontal excavation floor surface leads to the use of a thinner concrete layer. The leveling concrete’s surface must be completely horizontal without humps because upon that surface the foundation elements will be marked and the foundation reinforcement and moulds will be positioned. Under no circumstances must that leveling take place after the con-struction of the foundation by adding excavation spoil, e.g. leveling by means of an excavator, especially in the surrounding surfaces of the foundation elements. This happens so as to avoid alterations in the soil conditions that the designer engineer has included in the structural calcu-lations.